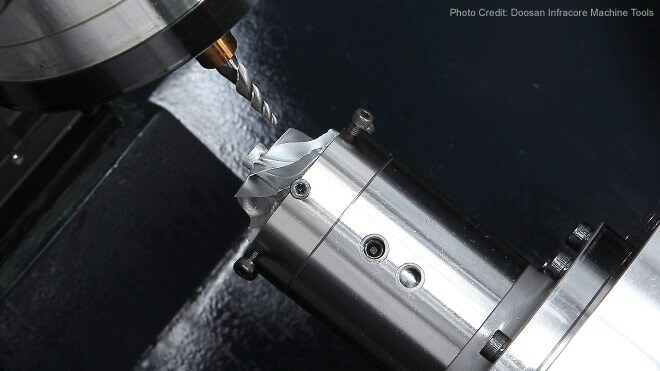 Five Benefits of Five-Axis CNC Machining | KLH Industries Inc. The major (and most well-known) advantage of five-axis machining is ability to machine complex shapes. The additional movement creates machining angles and arcs that were only previously possible with a multitude of special fixtures or additional setups. Imprecision finds a way to seep in with every setup change. Once a part comes out of the machine, precise alignment is lost. By using the same “zero” or “home” location, feature-to-feature accuracy is improved. There are parts that can only be machined with simultaneous 5-axis movement. Then there are parts that are more efficiently machined with 3+2 movement. In 3+2 machining, the fourth and fifth axes are used to locate the work piece (or cutting tool, depending on the type of machine) in a fixed position. In these scenarios, there is no need for all five-axes to move simultaneously. The same tool paths could have been achieved in a three-axis machine, but only after loading and unloading between multiple setups, fixtures, or machines. The five axis machine increases uptime, decreases human error, and eliminates the need for special fixtures. For parts with features or holes on multiple faces or angles, 3+2 machining is the clear choice. Using the rotating fourth and fifth axes, the part can be orientated to bring it closer to the cutting tool. If the part can get closer to the cutting tool, then the cutting tool can be shorter. A shorter cutting tool is less susceptible to vibration at higher cutting speeds, which directly impacts surface finish. Five-axis machining services from KLH Industries are currently available. Discuss your upcoming five-axis or CNC machining project by contacting us here, or submit an online RFQ here.